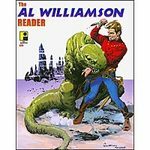 More EC classics are on hand here, with 34 classic tales by Al WIlliamson, with a little help from his friends, Frank Frazetta, Roy G Krenkel, and Angelo Torres. A strong majority of these are science fiction stories from the classic series Weird Fantasy, Weird Science and their offspring, Weird Science-Fantasy (as well as one from the post-code Incredible Science Fiction) - among them three adaptations of Ray Bradbury stories, including the classic "I, Rocket" – but also included in their number are a handful of equally classic crime and horror masterpieces from Shock SuspenStories, Crime SuspenStories, Tales form the Crypt and Vault of Horror as well. Copious bonus material is on. Jump on board and take off now with this 22-page PDF preview.